The promise was: Finish One Project. Cast on One Project. Well, how's the Finish One Project. Cast on a billion projects (but finish a small project) promise? 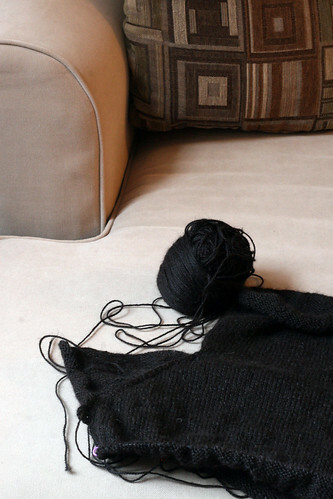 I'm on to the body on the Lightweight Pullover. The alpaca yarn that I bought at Rhinebeck has been such a pleasure to knit with. It just flies over the needles! The pattern is also so simple and straight forward that it's been a great mental "time out" knit – nothing like serenity stockinette. 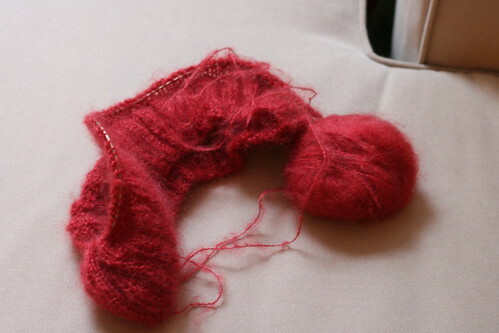 I can tell already this is going to be a much worn sweater when it's done. OH and of course another Infinity Scarf! 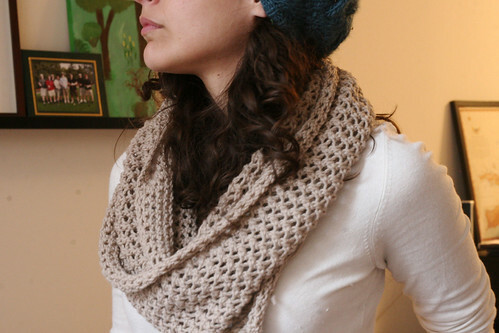 It's a bit of a thrill to see my pattern in the "New and Popular" pull down on Ravelry! Eeee!! 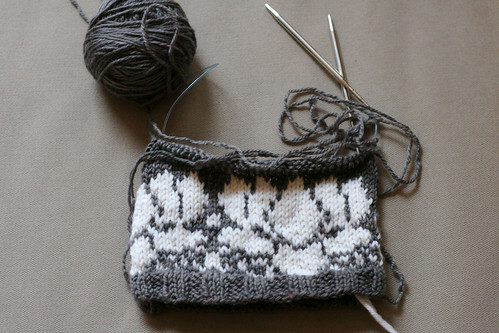 This time around I used Aslan Trends Del Cerro wool. I only used 3 skeins and casted on about 20 less stitches (221). I can't stop looking at it. I've put in the order for the catalog so the yarn scheming has begun. I am thinking some Zara DK for this knit. In the mean time to fill the cape void I did cast on for Aimee. Oh Kim, how you excite me. And last but certainly not least I have jumped into Vestvember (Ravelry link)! I'm still excited about my finished Honeycomb vest so of course when I read Minty's post I had to join in to make another. I am thinking of using the pattern Nederland from the Fall 08 Knitscene. I want to replace the argyle pattern with lotus leaves. I blame these Boden vests for the idea. I actually did a swatch which is turning into a hat for myself. My new knit friend Illanna thought it was very Zimmermann of me! I'm actually thrilled with out the leaf pattern turned out! Who knows maybe I'll write up the hat pattern too… hmmm! On top of all this great knitting Mr. Tenten and I are moving! Just a few blocks from where we are now but we all know how FUN (read sarcasm here) packing and moving is! pfffff!! I know we're moving in the right direction and perhaps somewhere in the near future we'll have a good ol' mortgage payment to pay but it still doesn't make the process easy. Ahh the act of growing up. Until then – Happy Knitting! I love the lotus leaf pattern! can’t wait to see the finished hat & maybe soon, a started vest? Wow! Looks like you have a lot of fun! Lots of activity knit-wise and moving-wise! That’s great! Everything looks fantastic! Congrats on hitting the New & Popular patterns. I always check those. Very cool! i absolutely LOVE your infinity scarf!!!! thanks for the pattern. and yes. that cape. is FABULOUS. Yummy! Lovely stuff you have on your needles. That lotus pattern looks great! OMG! Where do you find the time to get all of this knitting done? Everything looks great! Woo! So much good stuff! The lotus pattern looks amazing! I would definitely wear it as a hat. 🙂 Also love the cushions on your couch and wish you the best of luck moving! ooh, amazing projects in the works!! love that lotus. I love that cape! I may have to go search for the catalog now!